Jeff Burks turned up a great print dated 1651-1725 (artist unknown), that is owned by Herzog August Bibliothek in the German city of Wolfenbüttel. 1. A “slab” bench. I don’t write about these styles of benches much because I haven’t seen any in person yet – only in paintings and drawings. The benches show up fairly regularly in the images in Mendel’s and Landauer’s house books. They appear somewhat built-in at times, and sometimes have a suggestion of an undercarriage. 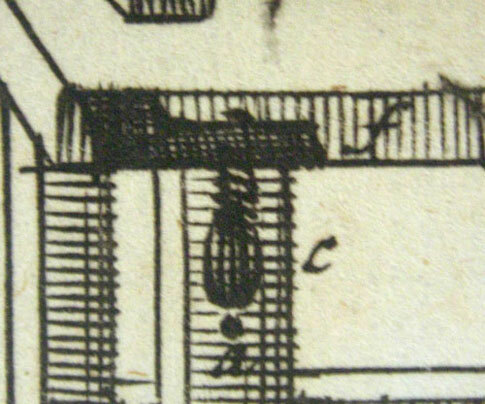 The bench screw in the Wolfenbüttel illustration appears to be made with a through-tenon that is pegged. 3. The sawbench/axe bench. These proto-Windsor-chair things show up in early illustrations a lot. I like this one because of its slightly curved legs. What Jeff and I can’t quite get our arms around is the text below the illustration: Wil ich mein Sach mach schlecht und grecht bin ich alzeit ein armer Knecht. A Google translation of the text doesn’t turn up anything meaningful. If anyone out there can offer a better translation, we’d be grateful. This entry was posted in Personal Favorites, The Art of Joinery, Workbenches. Bookmark the permalink. Hi, you are right to set an imaginary comma after ‘schlecht’. So an obvious translation could be “if I’m doing my thing bad than it’s only fair I’m always a poor enslaving”. For “und g’recht” we can also say “and justly”. The german saying ‘schlecht und recht’ (perfect and upright) is not meant here. I’m thinking “Sach(e)” means “business” instead of “thing” in this context. This is because the man is not obviously making something bad. Then the translation would be “If I run my business badly and [grecht]ly, I’ll always be a lowly servant”. I couldn’t find any translation for ‘grecht’ either. Could be ‘gerecht’ (as in ‘right’), but that doesn’t seem to fit with the rest of the statement. This sounds like a caption contest waiting to happen. All joking aside, if the translation does turn out to be about needing to run a tight and tidy business, lest one become a pauper, a small poster size print with the English translation underneath would be a really cool product. No hobbyist that I’ve met likes to think they’re taking up a manufacturing job as a hobby. But it’s true. And not running a tight shop can turn a fun pastime into a money hole if you’re not careful. Yeah, I’d love a poster print of this! “because I my property make bad and >grecht< am I always a poor servant"
can't find anything definitive on "grecht". If it is an antecedent to gerecht, that means fair or righteous, which would imply a wavering in the workman's quality, i.e. "because I do my work bad and good, i will always be a poor servant." Grecht certainly isn't a canal, or a hair salon, or a race of monsters from the text game Aetolia. hope this helps. 1. The planing stops on the left side of the bench in the first image. Looks like a set of three – and not really in any particular order (looks like two aligned on a perpendicular line from the front of the bench and one in front of this line. Have you seen this type of arrangement on other benches? 2. All of the tools pictured are identifiable. I guess I mean to say none of the tools present leaves me wondering what the heck it is, which often happens with old pictures or even old tools in the hand. Some tools fall out of favor, but not those in these images. One more thing. I clicked through the link to Mendel’s and Landauer’s house books then clicked on the image on page of the guy doing what ever his occupation was, which took me to a page about that one image, then clicked on that image on that page and was treated to a vastly enlarged image by itself, with links at the top to scroll through the rest of the images in the book in the enlarged form. Some occupations are easily recognizable while others – well is he an alchemist, a doctor or the court poisoner? You’ll want something better I suspect. My German has always been poor but I’m pretty sure the translation of “grecht” is painful. The guy in the first picture was quite the trend setter. That has got to be the oldest known record of a dog sweater! I bet he had a man-purse to carry it in too. I would translate „Wil ich mein Sach mach schlecht und grecht, bin ich alzeit ein armer Knecht“ to “If I want to just make acceptable things, then I will always remain a poor servant”. „Schlecht und grecht“ (grecht = recht) is a colloquialism for „just acceptable“. “Schlecht” in the 17th century meant “simple/plain/smooth” and not the modern translation of “bad”. “Recht” means “right”. So we end up with simple but ok, aka just acceptable. “Knecht”, at least in the Bavarian context, is a man that traditionally worked on a farm or for another business man as a servant under tight direction. He received only food/lodging, maybe marginal income and a master/servant education. I grew up in Bavaria and at 25 moved to the States, so spend about half my life here and there. My Swiss friend says there is a more subtle message here. He says the saying suggests, “If I only make things that are typical or average instead of trying to make things which are special I will never achieve anything really fine ( as a craftsman ).” I think this also provides historical provenance for all those people with slab door work benches. Is there are a possibility of getting a print made of this? I see the file says Low Res, so that implies a High Res… Anyone know a good print service that this can be uploaded to? I’d like to add this to my collection of prints of old timey (and by old I mean Moxon old) prints. A good Contemporary English translation would be, “If I do a poor job I will be a poor man”. Not that I’m qualified. Great find. I had a quick browse through the image library at HAB. I still have seen such mobile sharpening service in Brussels Belgium about 1960. Although the handcart had bicycle wheels. The grandfather (born at the end of 19th century) of my secretary was earning his live that way, going from village to village (the distances are much shorter here then in the US). In French it is called “un rémouleur”. Come on Chris, you’re trying us! “Schlecht und Grecht” is the more or less direct translation of “tried and true”. The etymology of “schlecht”, which nowadays is translated 1:1 to “bad” is “schlicht”, which in turn – while today meaning “undecorated” or “featureless” was at the time around 1600 “tried” “flattened” “initally smoothed”. Try Plane, right? “Grecht”, while only missing an “e” to become “Gerecht” is not the adverbial use of “Recht” meaning “Law”. In this context it’s correct etymology lies in latin “rectus” becoming “regere” in the correct form (passive participle says my dictionary), which means “to technically (!) make straight”. Alzeit is “Allzeit” or “Allezeit”, which can – while directly being translated to “forever(more)” – be constant, never-ending as well, like in the legend of (ta-daaa) Sysyphos. Knecht is Menial, or Slave. It refers to lowly jobs and answering to superiors. 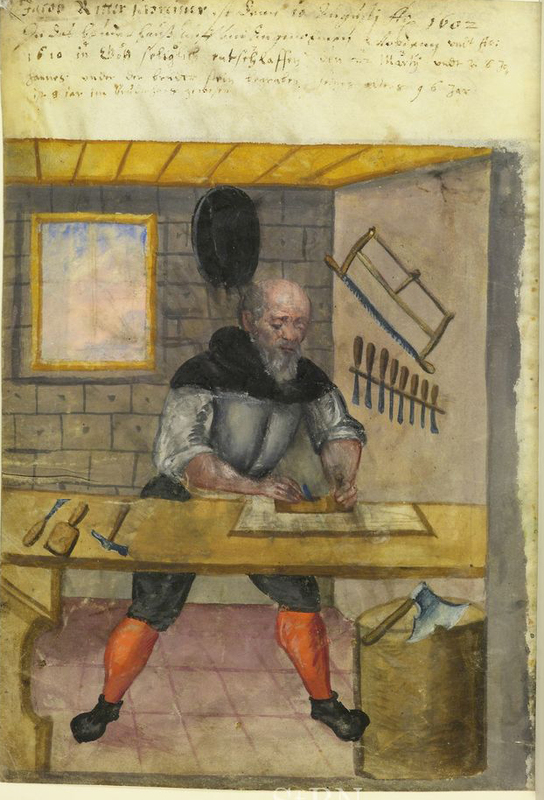 But being a cabinetmaker (“Kabinettmacher”) or joiner was in no way a lowly, but very well respected job. The Joiner (a go-to word, alright?) In the picture is obviously sighting down a thin strip of wood. And he’s probably just tired of keeping everything tried & true, as even that small thin strip of wood will shrink, warp and twist, and staying ahead is a never ending story. “To make everything straight and true is an ever present menial task”. “To make each and everything as perfect as possible can become a major PITA”. Jeff, Chris – Thanks for digging up stuff like this! thanks, that is a great clarification of this thext. Most of the translations seem to have a wistful or philosophical tone to them but judging by the body language of the dog I would guess that the man is in a fairly foul mood (hence the seeking of sanctuary behind a board) and that an accurate translation would be more of an expression of frustration or exasperation. 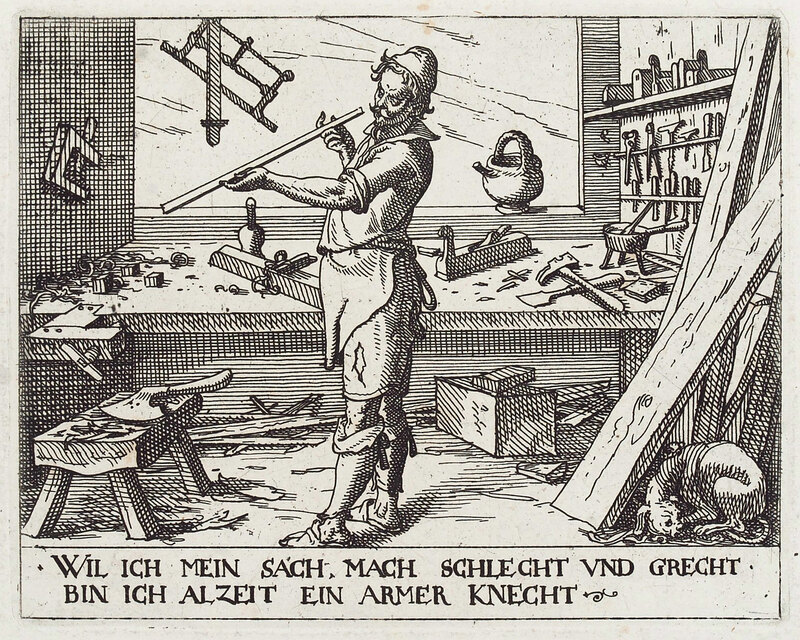 Well I have no translation to offer, but has anyone noticed the ‘Scandanavian’ shoulder vice with pinned mortise-and-tenon attachment the front of the first fellow’s workbench? I guess that might be simpler to build than the five-legged bench Tage Frid and Frank Klausz built. Yes I noticed it because it is the same as on my Swedish bench. I have not really come to terms with mine yet though. I attempted to send a translation directly to the “comments” email address. Don’t know if it got through. Wait, they moved Bavaria to Canada? Better change my summer plans. I coughed up my drink when I read this. LOL. Do you think the shipping-costs will escalate? I am excited by Robert’s comments about the three metal bench hooks on he bench. Or ,are they wooden pegs? Long square pegs that are a part of a thee peg and wedge holding system. They can be knocked down out of the way. Chaimakers have used such a three peg and wedge holding system. The three pegs are perfectly located for this. Also knock down the single peg and place a stop board in front of the other two. This allows work on wider stock or frames. You can get the same result by running a board perpendicular to the bench’s front. The overlappinf front and back have chocks underneath that lock the board in place. Secure the backer board with a holdfast or back it up with a metal bench hook. I do this frequently. The Stent panel also shows a hewing hatchet lying on a low bench. There is no need to use the Windsor chair to describe the low bench. The low bench is the Windsor’s great, great grand daddy. Medieval manuscripts are full of them.. A useful, though not aesthetic, generic term for this contruction is “slab and post.” I prefer the low bench for light hewing. I leave the slab deep bellied and heavy.